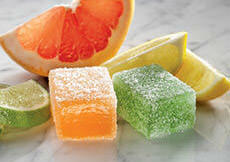 Smooth candies with a juicy twist! Inspired by popular cranberry juice blends, we've mellowed the sweet-tart taste of cranberries with fruit juice for a delicious treat that's perfect for the holidays or any time! Cranberry-Grape, Cranberry-Apple, & Cranberry-Orange, plus All Cranberry. INGREDIENTS: sugar, corn syrup, modified corn starch, fruit [fruit juice from concentrate (cranberry, apple, grape) cranberries, candied orange peel], pectin (pectin, disodium diphosphate, sodium polyphosphate, dextrose, dicalcium phosphate), natural flavors, sodium citrate, citric acid, malic acid, soy lecithin. 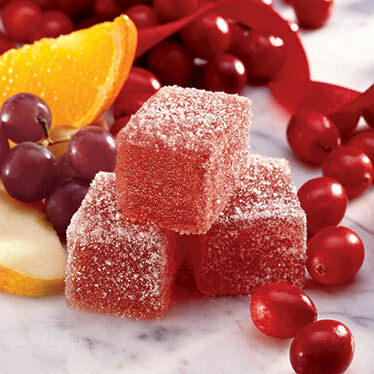 These sweet candies, with a tiny dash of cranberry tartness, are the perfect hostess gift. They should be available for Valentine's Day! My grandson, who is 8 yrs. old, has many food allergies and it's such a relief to find candy that doesn't have dairy, chocolate, and food dyes in it. In the past I've always gotten him Fruit Delights, which he loved but he thinks it's great that there are other candies that he can eat. 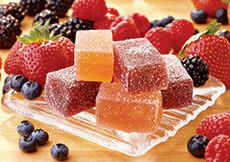 These candies are delicious! 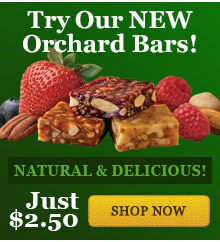 They have a true, natural fruit flavor and the right blend of sweet/tart and a nice soft but not squishy texture. If you like cranberry juice blends, you'll love these!